Check in time is 15:00 hrs and we will always try to have your room ready for your arrival. You are welcome to check in anytime, but if your room is not ready before 15:00 hrs then we can store your luggage for you. Check out time is 11:00 hrs and late check outs are £40 per room up to 14:00 hrs. (subject to availability). Guests arriving after 23:00 should Email us for key code to hotel. Delayed flight arrivals please press bell at Hotel. A full continental breakfast is included in the price of your room. 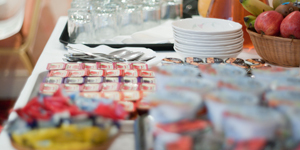 We offer a buffet of pastries, fruits, cereals , yoghurts, cheese and juices. Also you can enjoy a Full English Breakfast freshly prepared for you for a small surcharge payable at reception. Breakfast is served from 07:30 - 10:00 hrs Monday to Saturday and from 08.00 - 10:30 hrs on Sundays and bank holidays in the breakfast room on the lower ground floor in 115 St George's Drive.